When you choose the Viva Grass – Royal Grass artificial grass, you get to enjoy your garden carefree, without having to put much time and effort in maintaining your lawn. Our latest quality, Exclusive 3.0 is actually not entirely new. Royal Grass Exclusive 3.0 is the successor of Royal Grass Exclusive, our most popular sand filled artificial grass system. This sand-filled artificial grass system has already proven itself in the last 10 years, in its original version, Royal Grass Exclusive. Royal Grass Exclusive has been on the market since 2005 and has proved to become our most popular sand-filled turf system ever since. 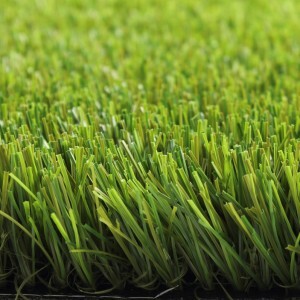 Many thousands of gardens have been installed with this Royal Grass quality in the meanwhile. Why change a winning team, you may ask? We want to bring the innovations that we as Royal Grass have done in the past years into our bestsellers, to give you the best artificial grass experience! 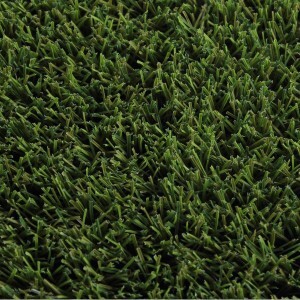 Royal Grass Exclusive 3.0 consists of three times three shades of green, which gives the grass a summery, rich green colour. After installation, the grass is filled with earth brown ‘ceramic sand’ and enhances the natural effect. Because of its brown colour, sand filling gives the grass an extra nuance. It also affects the position of the grass fibres. The fibres are not all positioned in the same way, but must find their own position when the sand is brushed in. The backing is stitched with a nine-fibre stitch where we used eight-fibre stitch in the previous version. This improved coverage gives the quality a fuller appearance. 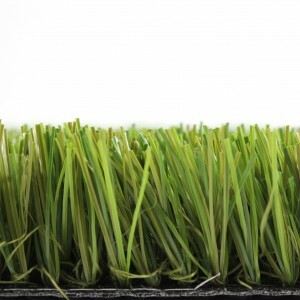 In many artificial grasses you can detect a pattern, but with Exclusive 3.0, that is not the case. The mixed greens give the grass a gorgeous sunny appearance.